In recent days, I have found myself contemplating what I will do next in life. I have this pulsing desire to leave this current situation behind. I want to put so much distance between me and all of my past romantic relationships and scratch out a new existence all by myself. I know I will not do it all by myself. My family and friends are so much a part of my transition. But I feel the need to be all by myself in the world. As crazy as that sounds, I need the peace and tranquility of being alone to find ME again. I need to stretch my legs and gather new experiences and remember the girl I was and figure out the girl I am going to be. Much of my adult life has found me searching for true love and seeking to find that spark, that magic, that fire. In recent months, I straddle this line between rekindling past love and all of the history that comes with it or should I move toward something brand new without any history or pain. The pattern I find myself in is that I want men that don't want me. Well they want me or they think they want me but they have no idea how to fulfill my needs. They don't pursue me in the traditional way that I dream of, the way I saw my father constantly court my mother or the way I watch my older brother with his wife. I have such beautiful examples of love, unconditional, all around me. How is it that my selection in men is so poor that they always find a reason to leave me? I have buried two marriages in my short life and right now, I cannot love like that again even though I love being in love. There is no better feeling than the butterflies that arise in my belly when I am in love. There is no better feeling than to be desired by a man that I am absolutely head over heels for. And yet, I have not clearly defined in my head how I want the next relationship to look like moving forward. I would agree with anyone who says that right now is not the time to look for a new love. And yet I feel the stirrings in my belly again. I feel the magic of explosive new love and at the same time, I feel the burn of old love and my mind cannot decipher which is the right way to go. At best, the right way is to sit in stillness and not choose a path at all. The path that is beckoning to me is the one that puts me above everyone else. I cannot live my life for another and neither can they live for me. Just recently, I started watching the TV Show THIS IS US. The writing is so fabulous. The story line so real and the actors and actresses that bring it to life are stellar. The most recent episode I watched, there is a particular scene where one of the main characters is prompted to seek out his one true love. Kevin shows up at Sophie's door unannounced after not having seen her in 12 years. She was once married to him and he left the marriage. He tells her that she's the one that got away. Side Note: Every single episode of THIS IS US is chock full of raw human emotion. Love, hate, resentment, anger - it just covers so many emotions and I cry with every single episode. When Kevin shows up at Sophie's door and reveals his regrets, it instantly reminded me of my own failed first marriage. Everyone has a first love - the one they gave their entire heart to. My first love was also my first husband. I have written about our relationship several times before on this blog and in my handwritten journals. At the end of that marriage, I never quite moved on. It's like he took the biggest piece of my heart with him when he left. And what was left for my second husband was a tiny fraction of my capacity to love and yet there's no denying that I did love my second husband also. This recent break up with him has brought all of the pain and loss of both marriages to the forefront and I grieve. I still sob when I think of the loss of the two great loves in my life. This prompts me to want the magic and electricity of new love. I don't want to dwell on the pain of the past. I have been quite successful at burying the pain and pushing forward without addressing the wounds. But now, now is the time to purge and let it all go once and for all. I don't know what my love future looks like. What I do know is that I love the bliss of a love without any pain associated with it. What I do know is that magic can happen at the craziest of times and under the strangest of circumstances. What I absolutely know is that synergy and pure, raw attraction is alive and well in me. What I know is that I don't want to label or define the old or the new because it changes it, whatever IT is, and turns it into something I may not want. As I progress through the changing landscape of my life, I will do so with my eye single to my goals. I love to be in love but first I must work on me and that is exactly what I am going to do. 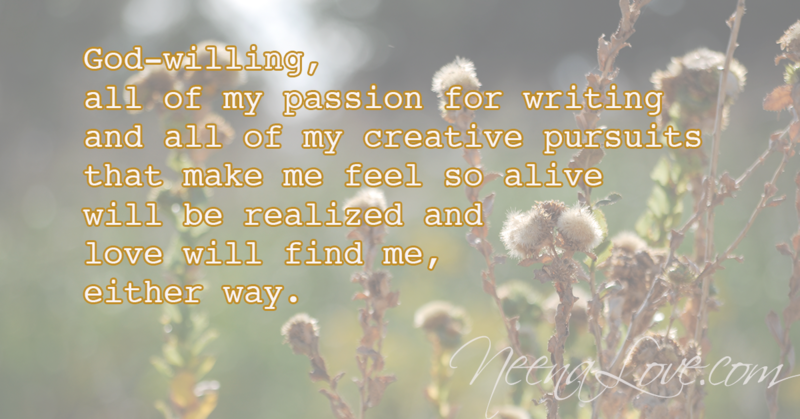 God-willing, all of my passion for writing and all of my creative pursuits that make me feel so alive will be realized and love will find me, either way.